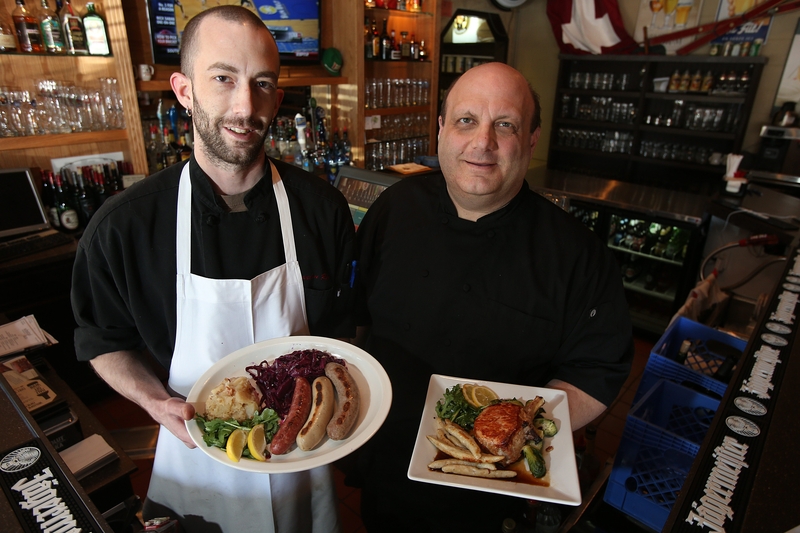 Chef Brandon Rug, left, displays the sausage platter and owner Michael Rizzo, right, shows off the pork chop plate at Schnitzel & Co. in Amherst. If you want to eat Italian food in Amherst, the Rizzo family has you covered. Four places run the spectrum, from red-sauce and banquet settings to Rizotto, the fine dining restaurant. They’ve made a lot of customers happy, and there’s another pizza and seafood-centered place coming on Transit Road. In September, the Rizzos tried something new on New Road: a Swiss-German menu in a replica German pub. There are lots of German classics on the menu at Schnitzel & Co., from four varieties of eponymic schnitzel to sausage and sauerbraten, and a tidy selection of German draft beer. The house-made pretzel makes a fine first impression. Our meal included excellent dishes, but some duds, too, and our service experience had its ups and downs. After the standards the Rizzos have set elsewhere, my visit left me feeling like something was lost in translation. The bar, where you enter, has been done up with skis and beer signs and a shelf of steins. In the dining room, tables include a long one with a church pew on one side. A wall of mirrors makes it feel more roomy than it is. The menu is a single card, sporting 11 entrees the night we visited. A drink special caught my attention, a flight of four 4-ounce German drafts for $8. Selections ran from light Ayinger weissbier to the thick, sweet bombast of Spaten Optimator, making it a flight worth catching. We ordered the house-made fresh pretzel ($4) with cheese sauce and mustards and beer cheese fondue ($7.50), because some people cannot get enough melted cheese. Chicken dumpling soup ($3.50) and a fig and goat cheese flatbread pizza ($7.50) also beckoned. We also asked for a spinach salad ($8) with hot bacon dressing, and frikadellen, which is meatballs on pancakes with gravy ($7.50), and also my new go-to curse-word substitute. For an entree, I chose Jaeger schnitzel ($16), a fried pork cutlet with mushroom gravy. Cat had the chicken schnitzel. Our guest Mark opted for the three-sausage platter ($15), and Laurie had the birch beer glazed pork chop ($19.50). Our sides included potato and sweet potato pancakes, Brussels sprouts and two kinds of dumplings, spaetzle and fingerling dumplings. Our server, who was thinking ahead and responsive all night long, removed our appetizer plates from the table before the appetizer flow started to avoid the predictable plate jam. We tore into the fresh pretzel, and its yeasty fresh-bread taste and tender crust prompted me to swear, on the spot, that I would never eat another desiccated, cardboardlike sporting arena “soft” pretzel. The mustards were interesting, and the cheese sauce more buttery than creamy. That’s why the fondue came in handy, arriving in a bowl alongside an assortment of dunking candidates: sliced apples, white and pumpernickel bread pieces, and raw broccoli. The fondue delivered rich, soothing cheese flavor. I found it grainy, but no one else cared. The raw broccoli seemed like an odd choice, but crudités work with cheese, too. The chicken soup was satisfyingly homey, with carrots and chunks of chicken, dumplings that were soft but not mushy. The flatbread pizza was decent, with ample goat cheese and arugula, and figs that reminded me of Fig Newton filling. The spinach salad arrived with lots of greenery, hardboiled egg, tomatoes, shredded carrot and crunchy house-made croutons and red onion. But the small half-full ramekin of dressing wasn’t enough. After it was administered and ceremonially tossed, the underdressed salad lacked bacon flavor. The frikadellen were terrific. Bite-sized meatballs on coaster-sized potato pancakes, topped with mushroom gravy – any one of us would have been happy to make it our own. Cat’s chicken schnitzel was moist inside, under a luxurious cream sauce, but the crumb coat fell off under knife and fork. Laurie’s pork chop was a success, juicy even though the advertised glaze was scarcely in evidence. Mark’s sausage array was satisfying, from the smoky mettwurst to the mild, fine-grained veal and pork weisswurst. My schnitzel was a success, too: two pieces of pounded pork that were crispy at the edges. The gravy tasted like ham and mushrooms, which I appreciated. The chunky housemade applesauce was fresh and fruity, but other sides weren’t so solid. The potato pancakes were faintly browned and soft. Their sweet potato cousins oozed oil when cut. The caramelized Brussels sprouts were more like blackened. The spaetzle weren’t small worm shapes, as I’m used to, instead looking like flattened potsticker dumplings. They were chewy and underseasoned, but the fingerling dumplings, about the size of white asparagus, were leaden. For dessert ($4-$5), we ordered German chocolate cake, fastnachts, apple strudel and angel food cake with berries. The fastnachts, fried dough, were admirably thin and light, but they tasted like oil and the sugar coating was uneven, leaving some bites unsweetened. The moist cake was rich with caramel and coconut. The angel food cake was unalloyed sweetness, with no relief from the berries. I liked the apple strudel best: real apples baked soft in tender, house-made pastry. Earlier in our meal, a manager helped our server hustle entrees to the table. He dropped an applesauce ramekin off a plate, where it deflected off Mark’s head and landed with a splash. The manager said he was sorry several times, then hovered near our table. No offers of recompense – cocktails or cleaning – were made. At meal’s end, when the blameless server arrived with the check, she told us the desserts were on the house. I wished the manager had said so earlier. It didn’t ruin our evening. Combined with my uneven food experience, though, it left me thinking Schnitzel could use more polish to live up to Rizzo standards. Aside from beer and pretzels, Swiss and German menu fare proves uneven. HOURS: 4 to 10 p.m. Monday through Wednesday; 4 to 11 p.m. Thursday and Saturday; and 4 to 9 p.m. Sunday. PRICE RANGE: Soups, salads and small plates $3.50-$9; sandwiches, $8.50-$10.50; entrees, $11.50-$19.50. PARKING: Lot. WHEELCHAIR ACCESS: Yes.